I just got an e-mail from Kevin giving the GOTSMOK community the heads up that the purple efest batteries have been restocked over at 101! Among those batteries restocked are the 18650 30A, the 18500 15A & the 18350 10.5A. So… if you’ve been waiting to jump in on this deal… get your orders in before they sell out again. Don’t say that I didn’t warn you. =) And, before I forget… thanks for the quick heads up Kevin. I know everyone is having trouble finding the 18650 Efest purple 35amp bats, but today I’ve actually found two places that has them, so you sub ohm guys best hurry. 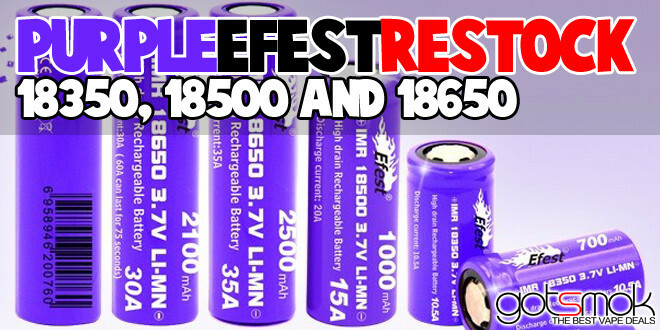 HARD TO FIND – Efest IMR 18650 2500mah 35amp Flat Top Battery- NOW AVAILABLE!!!! $12.99, this is the company I bought from and they are amazingly fast as I mentioned. Well I’ll show them, I’ll just buy some more, NO body is going to make a fool out of me, hah that will show em.